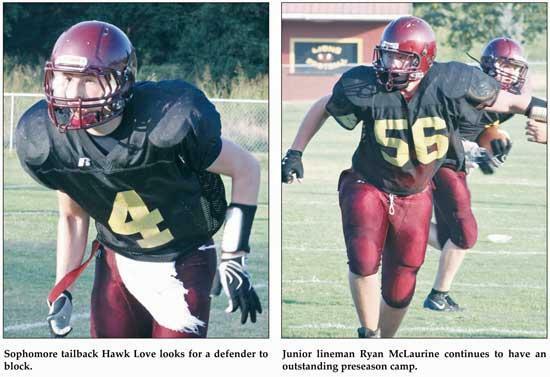 Stats and records from preseason scrimmages do not count in the standings but the results of Cannon County's first competition during camp were positive. The Lions passing game was strong and the defense was vastly improved against White County Thursday (Aug. 4) as Cannon County battled the Class 5A team through a competitive workout. The score was tied 14-14 when the varsity portion of the scrimmage ended. Cannon County's defense also was much improved from a year ago. The Lions eliminated the big plays and safety Justin Tobin created a turnover with his interception in the end zone. Sophomore quarterback Ryan Jordan sparked the Lions aerial attack with touchdowns passes of 45- and 35-yards to newcomer Cody Petro and sophomore Waylon Sedtal, respectively. Cannon County's ground attack was not as productive; however, Hawk Love and Brandon James, who also saw action at quarterback, did have their moments and showed an ability to move the chains. "I thought Ryan did well," Cannon County Head Coach Joel Schrenk said. "He got his feet wet in the spring game, and he comes with a grasp of the offense and knows where the ball is supposed to be. The screen game was pretty good. The run game was pretty poor. Overall, the passing game needs improvement, but we are ahead of where we were at this time last year." A young and developing offensive line, featuring one senior (Thomas Stone), one junior (Ryan McLaurine), two sophomores (Dalton Ryan, Dillon Jackson) and one freshman (Allan Robinson) continued to showed signs of improvement. Mistakes due to inexperience were evident but limited. "The line is working hard and we are getting better," Stone said. "We need to come out better. We were kind of flat early but we picked it up as the scrimmage (developed). We have some young guys that are good. They are just young and they need these reps to keep getting better." Cannon County's passing game presented more of attack even with senior Justin Weaver out of the lineup for Thursday's scrimmage. Petro's crisp route running and the exceptional speed he brings was on display when he turned a quick pass into a long touchdown. "I thought the offense looked good," Petro said. "Ryan looked good at quarterback and Brandon (James) did well. We looked good early but then we started getting tired so we have to continue getting in better shape." Sedtal also was impressive and he showed break-away speed on his 35-yard score. "That was a great play by Waylon," Jordan said. "I just made a 10-yard throw. The rest was all Waylon and the linemen getting out there to block. We started off well and showed a lot of improvement since last year because (White County) beat us last year. We can get better but today was good." Cannon County's defense also had an overall good showing. The Lions feature a great deal of youth, playing as many as 10 freshmen and sophomores together at one point, but those players competed and gave their team a chance to win. Sophomore linebacker B.J. Daniel, who was thrown into the fire as a freshman at midseason, had a strong scrimmage and helped spark a defense that was not a victim of giving up the big play. "We played pretty good overall and this was a good showing today," Daniel said. "We have a lot of work to do but this scrimmage showed that we are improving. You have to put in the extra work at practice. It all starts in practice. If we continue to work and prepare like we are now then I think we are going to have a good season." After playing corner in 2010, Tobin has thrived at safety during the preseason and the hard-hitting junior put practice into the scrimmage against White County. He manned the defensive backfield with a strong presence and hauled in an interception. "I like safety more than corner," Tobin said. "There is more ground to cover and you can roam back there and cover more people and hit more people. I love it back there. We made some mental mistakes in the scrimmage but the mistakes we made can be fixed in practice. We need to get those mistakes corrected and have the season we believe we can have." Schrenk was pleased with the defensive showing. "The kids played hard. Defensively we lined up right, made good adjustments and, for the most part, we made good reads," Schrenk said. "We are not physical enough yet and maybe we had some poor technique at times but, overall, I think we showed improvement." The Lions continue preseason camp this week and will scrimmage at Middle Tennessee Christian Thursday at 7 p.m. Cannon County opens the season at Watertown Aug. 19.